Posted on Wed, Dec 7, 2011 : 5:59 a.m.
Head football coaches are pretty busy in the fall. Especially the successful ones. Brady Hoke is pretty successful. Since the conclusion of the regular season, though, the Michigan football team's coach has had a little more time to relax and catch up on the finer things in life. No, he wasn't doing laundry. He wasn't changing light bulbs, either. But he did go to class. Hoke talked about a recent visit to campus while chatting with a small group of reporters in Indianapolis last week. He was honored there for winning the Big Ten Coach of the Year award. 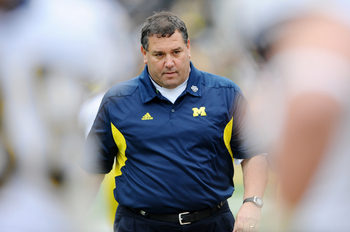 Michigan coach Brady Hoke tries to be "incognito" when he sits in on his players' classes. Part of coaching, he said, is following through on the players' academic progress. "During the season, I don’t get out as much because of my schedule," Hoke said. "So, when I have some time, I like to be on campus and like to see what guys are learning. "I think that’s part of the obligation we make to the guys we recruit — about the education and supporting them and being there." The class was a Department of Afroamerican and African Studies course, and the lecture centered on the impact of British marching music in the Caribbean. That's a far cry from his coursework while a student at Ball State, where he majored in criminal justice and aspired to join the Secret Service. "It was pretty neat, to be honest with ya," Hoke said. "I took notes." The class included about "eight or 10" football players, Hoke said. Only, they weren't told their coach would be there. One of those players, apparently, was freshman defensive end Chris Rock. Hoke has guided the Wolverines to a 10-2 record during his first year as coach and a berth in the Sugar Bowl, where they will play No. 11 Virginia Tech (11-2). Not bad for a team that was 15-22 the past three seasons. For those efforts, Hoke has been named the Big Ten's Coach of the Year and now is a finalist for multiple national coach of the year honors. In other words, he's become one of the most recognizable faces in college football. Yet, there he was, sitting in class, hoping to blend in. "I try to be incognito, as much as I can," he said. Asked how well that worked for him, Hoke smiled wide before saying, "Some of the guys, their eyes got a little big when they saw me." And the price if any of the football players wouldn't have been there? "Then they’re up at 6 a.m. the next morning," Hoke said, flashing another smile. Fri, Dec 9, 2011 : 8:21 p.m. Being a coach of the field is a major factor these days. Just reading this article can give a person a LOT more respect for the man. Thu, Dec 8, 2011 : 2:04 a.m.
Thu, Dec 8, 2011 : 1:29 a.m. Kyle...Thanks for sharing this delectable tidbit with us. There alwasy seems to be a snarly varmint slinking around, but you do a fine job. Brady Hoke is exceptional in so many ways. This is one more. Thu, Dec 8, 2011 : 9:42 p.m.
Do you two share cooking recipes also? That skirts a little short isn't it? Wed, Dec 7, 2011 : 10:38 p.m. I like this guy more every day. The players are blessed to have Coach Hoke in their lives. Wed, Dec 7, 2011 : 5:56 p.m. I really like Coach Hoke. I'm glad that this time around the media and some of the arrogant members of the Michigan community like him as well. Just feels good to see Michigan articles that are consistently positive. Wed, Dec 7, 2011 : 5:21 p.m.
Fri, Dec 9, 2011 : 8:20 p.m.
Just because he's overweight doesn't mean anything. A person can tell much about someone else just by their avatar. Thu, Dec 8, 2011 : 1:35 a.m. Pig...Are you one of those people who like to denigrate (Oh, I forgot...put down) other people just to make yourself feel big? If you can't show the man some respect, at least show him some deference. He is a good man doing good things well. Wed, Dec 7, 2011 : 11:46 p.m.
And this is relevant to the story because? Wed, Dec 7, 2011 : 4:42 p.m.
MRunner73: A little history here... The concept of a head FB going to classes unannouced start with... are you ready??? Woody Hayes. Hayes not only would attend his players classes but would sometimes attend classes in fields of study that interested him (esp history) and ask pertinent questions of the prof. He even would drop in on classes while Buckeyes were at away games. Univ of Illinois has a (deservedly) highly respected chemistry dept. Hayes is reputed to have stopped in an upper level chem class. Needless to say the prof was quite surprised (and pleased) to have him in attendance. Ghost: Hoke does something good and you twist it into a slam about tOSU. Why does Blue arrogance and elitism always look down on land-grant institutions? We (tOSU, MSU, PSU, Purdue) have great programs and (in some cases) departments that don't even exist at Blue. Everyone: In this era where the media imparts symbolism into every action a person takes, it is curious why Hoke chose this particular course for his classroom visit. Why not a more mainline course offered by the English, math or history depts? Don't know. Don't care. At least he went to class. Maybe symbolism was involved, maybe not. As to the question about the approriateness of the subject being studied, remember Newton invented calculus long before it had any practical application. Many years ago a prominent senator awarded the Golden Fleece award for the greatest example of govt waste. I remember him pointing out a grant given to study the digestive track of snakes. I agreed... what a waste of $. Now I've learned snakes are sometimes used in GI research because they take their whole meal as a bolus and the meal can then be tracked through their system. That original research project is now used in colon cancer research. You never know where knowledge will lead. Wed, Dec 7, 2011 : 5:42 p.m. Wed, Dec 7, 2011 : 5:13 p.m.
That's what I wanted to know. I didn't think or imply Brady is first to ever do this. Some think Hoke attended the one African Studies class, it sounds like much more. Typical Kyle Meinke reoprt with him serving up another batch of kool-aid to the unintelligent masses. Kyle, what about the fact UM is Last in the B10 in graduating its student athletes? What about the fact UM was 69th out of 70 schools in the bowls graduating its student athletes. If anything a UM fan should be embarassed there AD, coach, president and administrators would allow the great Uof M to have this record. No, instead lets white wash it with another human interest story from the great sports writer Kyle Meinke. @Edward R Murrow, the sec schools have a much better record than UM. OSU is second in the conference behind Northwestern, but you keep telling yourself what a great job UM has done. @Hailmary, that black eye you speak of is coming right out of Ann Arbor. Fri, Dec 9, 2011 : 6:19 a.m.
rightmind tries to counter my post by making pretty much the same comment as before and still leaves out vital statistics. Yes Hoke grad rates under the current process to determine these rates should be low to but, that has nothing to do with rightminds original point he was trying to make. I also like how he avoids to comment on Adolphos Washington's &quot;even if your giving minimal effort there is no way to fail&quot; when refering to why he chose OSU. I live in OH, born and raised and beleve me some of the most worthless barely able to pass kids were accepted at OSU. One of my friends was a MLB draft ready prospect and 4.0 student coming out of High School and could get into Michigan, another one of my friends older brothers is very intelligent could get into anywhere basically said he had been turned down by Michigan Law twice. I would have to say Northwestern and maybe Penn St. are the only ones that can begin to be compared to U of M as far as academics. Every University in the country can claim a program or course that their rival may not offer, whoever tried to use that against MICH is reaching. I would like to know what the grad numbers from say 1950 (as considered the modern era of CFB) through present are for Michigan compared to OSU and the rest of the country. Thu, Dec 8, 2011 : 2:29 p.m. According to Maize and Blue Nation here are the graduating rates for Michigan Athletics: Sport Graduation Success Rate Federal Rate Football 72% 65% Baseball 82% 80% Basketball 36% 29% Golf 89% 89% Wrestling 55% 50% W. Basketball 53% 53% Michigan was 5th in the Big 10 in Football and Baseball. The NCAA also released that overall, the overall graduation rate from 2003 was 79%. This was the highest ever in Division I history and has risen a total of 12 points since tracking was established in 1984. Thu, Dec 8, 2011 : 1:45 p.m.
As a Penn State grad who had 3 of my high school friends go to Penn State on scholarship, I have to comment on the post asking about the standards at Penn State and Paterno's power. Let me state that if you missed a class you were in Paterno's doghouse. Players did get booted, or benched because of academics, if you want a list I will get it to you. Academics were part of Paterno's &quot;Grand Experiment&quot; and PSU football players under Paterno absolutely performed in the classroom. This was more important than on the field, if you question this ask Stepfon Green who was relegated to the bench because of academic reasons and just recently overcame them to get more playing time. By the way Green was upset when Paterno was let go because he felt that Paterno forced him to get his priorities in line and graduate. Thu, Dec 8, 2011 : 1:01 a.m. I lived and worked in Northern Mississippi for 4 years, and took classes at both Ole Miss. and Mississippi State. There is a way things work in the south. Everything is the good ole boy network. the newspapers, the public school, the police, the mayor, etc. all come to consensus. I wouldn't trust APR rates or anything at many schools north and south. Remember the cheating on the state tests in Georgia? Maybe the highest APR rate would be at the most corrupt school. Didn't Penn State have the highest APR rates under Paterno? We all see how much power that guy had. If yur an instructor would you fail one of Paterno's kids? How many of his star athletes were thrown off the team for academics like Tate? How many top recruits were told &quot;no&quot; like Demar Dorsey because the athletic department overstepped itself? Zero. Thu, Dec 8, 2011 : 12:31 a.m. Mind...&quot;The schools with the highest APR are coincidentally the schools with the highest academic standards.&quot; Then you include OSU????? Come on. What is this a joke or what. Open admission OSU has higher academic standards than the University of Michigan. Here's a word for you: GOOGLE. Try it out. Michigan (and I'll give you ND and Northwestern) is so far above OSU in academic standing and expectations and admissions and all other standards of academic excellence than OSU that even my PC is stuttering at your comments. Get real. Wed, Dec 7, 2011 : 9:55 p.m.
Nathan, I knew someone like you would try to spin this so let me Educate you. The schools with the highest APR are coincidentally the schools with the highest academic standards. The schools in the report only included bowl teams, but those included Stanford, Notre Dame, OSU, Florida. I do not deny for one minute that UM is a very good academic institution. That is exactly why YOU should be mad at UM not the messenger. UM has obviously let there student athletes down. Kyle you said Richrod failed because of all the tranfers? Well, by that logic so has Hoke. How many kids left the program this year? Wasn't it 6? The same number as Richrod. Wed, Dec 7, 2011 : 8:25 p.m. Funny how you rightmind, rips Meinke and accuses him of writing an article for the &quot;unintelligent masses&quot; then follow that up by making incredibly unintelligent comments yourself. You make points of Michigans current graduation statistics which for the most part are corret but neglect to leave out the key factors in how these stats are determined. Its no secret than U of M is much harder to get accepted into than OSU and the courses on average are typically more challenging. Also OSU commit Adolphos(?) Washington who had problems all throughout highschool and was a highly touted recruit lost alot of intrest from other programs because of his acedemic struggles stated at the press conference when he committed that he chose OSU because and I qoute.... &quot; It's the education part &quot; Washington continued. &quot; I know all these schools athletically can offer me the same thing. The academic support at ohio, there is no way you can fail. Even if your giving minimal effort there is no way to fail.&quot; Take that however you want but the &quot;Even if your giving minimal effort there is no way to fail. That coming from arguably OSU's biggest commit thus far. Wed, Dec 7, 2011 : 6:19 p.m.
rightmind, as I've already said, the APR dipped under Rodriguez not because of grades, but because of attrition. That is a big factor in the APR, which is an extremely complex formula that considers and inordinate amount of information. And that's why I also say &quot;I bet&quot; improves. Because, based on factors and information made available to me, it should. But the system is so complex, I can't put an exact number on it. So, you're right. No facts (as in, hard numbers). Just a hunch (based on all factors that are available to the public, making it an educated one). Wed, Dec 7, 2011 : 6:09 p.m.
Rodriguez failure? I can go back and find articles by aa.com touting Richrod as having the highest grade point average in the history of UM football. So which is it? To be first in APR takes a great deal of effort. That effort extends way............beyond the head coach. To come in last takes a huge non-effort. That is an institutional problem, get it? Indiana, Minnesota, Purdue have all gone through coaching changes, but somehow they couldn't come in last like the UM. Kyle, I am practically writing the story for you. Should we wait for the next headline: Kyle Bets the APR Rises significantly? No facts, just a hunch. Wed, Dec 7, 2011 : 5:11 p.m. Thank you Kyle and rightmind250. I read the article but this is about football players graduating and not all student athletes (in all sports). I have been informed. Wed, Dec 7, 2011 : 4:19 p.m.
MRunner, here's the story: <a href="http://annarbor.com/sports/um-football/study-bowl-team-graduation-rates-up-racial-gap-persists/">http://annarbor.com/sports/um-football/study-bowl-team-graduation-rates-up-racial-gap-persists/</a> It's true Michigan is 69th, but like I mention in my other comment, it's weighed down heavily by the attrition under Rodriguez (because the APR measures in a sliding 4-year window). In fact, despite losing 6 guys to attrition under Hoke this season, I bet the APR still rises significantly next year, simply because Rodriguez's first year will roll off. That's what is hurting Michigan the most right now. Not grades or in-class performance. Wed, Dec 7, 2011 : 4:16 p.m.
rightmind, I didn't include the APR for two main reasons. First, we had the report about it just two days ago. Second, Michigan's APR isn't at all Hoke's fault. Every coaching change will negatively affect an APR, and Michigan now has 2 (because it accounts for a 4-year window). Rodriguez's coaching tenure began will terrible attrition, which is what's dragging it down. Not Hoke's (or Rodriguez's) commitment to academics. Besides, this was meant to be a light-hearted, fun look at a big-time college coach dropping in on classes. Not something you often hear about. This wasn't meant to be a commentary on Rodriguez's failures with the APR. Wed, Dec 7, 2011 : 4:11 p.m.
How did you get these facts? What is the source? I have serious doubts Michigan is 69 out of 70 bowl participating teams. Is this just Football players or all student athletes? Wed, Dec 7, 2011 : 2:59 p.m. I also heard that coach Hoke makes sure that each player brushes their teeth and washes behind their ears each day. In all seriousness, thus far coach sounds like the real deal almost to good to be true. I think Brady Hoke is the real deal and I think Mich. is lucky to have him represent and coach us and I think Brady is good for the Big 10 especially at this time when the Big 10 is sporting a black eye. Wed, Dec 7, 2011 : 2:46 p.m.
Knotch, I wouldn't be so quick to judge the content of a single lecture or how it fits into the overall goals of the course. Sometimes esoteric subjects end up really important. I am mindful of the University of Nebraska professor who studied rocks in the middle east. Boring, right? Until Osama bin Laden releases a videotape and this professor could pinpoint what region he was in, based on the stratifications in the cliff he is standing near. But let's say the study of music and its effect on the British Empire is, in the end, a little &quot;out there.&quot; What of it? A big part of a University education isn't teaching a person specific facts. It's teaching a person to think critically, to consider how some unexpected factors may be play surprising roles in the outcome in fields like science, economics, history, etc. Some of the greatest advances in our society came from people who thought outside the box, who could bring to bear ideas from other fields, who were willing to try something that seemed tangential to others. I am therefore leery when outsiders--like commenters here, or lobbyists, or our legislature--attempt to pass judgment on what is &quot;worthwhile&quot; in a college lecture. Especially based on one line in a newspaper article. Wed, Dec 7, 2011 : 10:47 p.m. Wed, Dec 7, 2011 : 2:45 p.m. This is a good story and the first I have heard of a head coach sitting in classes. Perhaps it was done by any or all of the previous head coaches so I cannot comment any further about that. This does show the quality of coach Brady Hoke is. I think this also serves as a great monitoring tool. It can be interpreted two ways; Coach Hoke really cares; and the players know that the HC might just show up at one of their classes and they had better be attending. Wed, Dec 7, 2011 : 4:26 p.m. Wed, Dec 7, 2011 : 4 p.m.
Lloyd Carr frequently attended classes and sometimes was invited to lecture. Wed, Dec 7, 2011 : 2:12 p.m. I like the fact that Hoke is sitting in, unannounced. His actions speak, as loud as his words. Good for him. I think what we are seeing, is a statement here, that the players actions, on and off the field, are important. As for some commenting about the nature of the class, or the course offerings of the university. That is NOT the function of the football coach, so take that up with Mary Sue Coleman. All students at the university, athletes, or otherwise, have the responsiblility to take courses important to them, and to learn to think for themselves. It IS possible to be a conservative, at the U, and to take math and science here. Thu, Dec 8, 2011 : 12:45 a.m. I have an MBA, but my favorite classes where art history, Spanish (in which I am proficient- thanks to Michigan), linguistics, and all the history classes. That is what separates Michigan from a tech. school or a lesser University. If all you care about is a job- then an undergad. degree at Michigan isn't for you. Wed, Dec 7, 2011 : 4:44 p.m. Wed, Dec 7, 2011 : 2:58 p.m. Wed, Dec 7, 2011 : 1:52 p.m. Though this post has nothing to do with the article, I like your prediction. I believe they could run the table beyond Bama. And if they do, they will play for a national championship. Thu, Dec 8, 2011 : 1:13 a.m. I think Brendan Moore is a senior. Thu, Dec 8, 2011 : 12:25 a.m.
57-44-6. I think you could update your status to 58-44-6.Wolverine pride baby. Wed, Dec 7, 2011 : 2:47 p.m. Thanks for the prognostication but the story line has to do with the Head Coach attending class on some of his players. Wed, Dec 7, 2011 : 2:22 p.m. The big question is.....of these starters, which one will win the Heisman??? Wed, Dec 7, 2011 : 1:42 p.m. Wed, Dec 7, 2011 : 1:31 p.m.
Coach Hoke is to be commended for his interest in the player's academic progress, I am curious where Michigan football players rank in scholastic achievement and graduation rate. No negatives here, just curious. Wed, Dec 7, 2011 : 2:07 p.m. Wed, Dec 7, 2011 : 1:38 p.m. Wed, Dec 7, 2011 : 1:17 p.m.
At the end of the day, the job of coach is judged by wins and losses. But Hoke really seems to get that in college, and especially at Michigan, the coach is also judged by leadership, ethics, &quot;good example&quot; setting, and all of that. And Hoke is passing all of those things remarkably well. Is going to class a one time stunt? For some reason, I don't think so. I think Hoke in one year has established his own way which fits well into the tradition of Michigan coaches but also his own personal touches. Go blue. Wed, Dec 7, 2011 : 12:18 p.m. The impact of British marching music on the Caribbean-one of the great things about an education in Ann Arbor. Learning for the sake of learning. Not just 'show me the money&quot;. In this jaded age of Tressel and Paterno; I hope Hoke is the real deal. A guy who never compromises his or the Universities integrity. Ever. What Hoke says and does, will be with his players for their entire lives. Wed, Dec 7, 2011 : 12:12 p.m. It's great that Coach Hoke went to class. I would like to know what percent of students in the class the football players comprised. 8 or 10 out of 100, or 30? Is this an easy A class that draws football players? Wed, Dec 7, 2011 : 8:37 p.m. Typically, the athletes take several courses together, not any differently than any other group of friends. And easy A or not, at least they are going to class. Wed, Dec 7, 2011 : 1:16 p.m.
Why does it matter the percent of players to non players in this course. They all have a course of study they have to complete in order to earn their degree. This could be an elective. Also, if he has 8 to 10 in the class out of 125 players, that is only 10%. Not exactly a huge percentage if it was an easy A class. Stop trying to find fire where there is no smoke. Wed, Dec 7, 2011 : 12:04 p.m.
Coach Hoke...nothing to say except awesome! Players can respect a coach who cares their education. I think he should be the coach of the year in all of college football. Also, the sugar bowl is going to attract recruits...and they will hear about a coach who really cares, who leads by example. GO BLUE!